Never leave your couch to switch to a different Wii game disc ever again! Archive ALL of your original games onto this external USB hard drive. All hard drive sizes work with the Wii: 500GB to 3TB! Homebrew Channel REQUIRED and is NOT INCLUDED. Link is back and he brought gifts. This Zelda release is bundled with the Skyward Sword Game, Music CD Soundtrack and Gold Wii Remote Plus w/Triforce Symbol artwork. Limited Edition gold controller. Buy 2, your kid will thank you in 25 years. :) Compatible with the new Wii U. This awesome New Super Mario Bros themed lunch box comes packed with New Super Mario Bros game, 4 Wiimote static cling controller covers and T-Shirt (large)! A must have for all collectors! Get in shape with this Wii Fit Plus Bundle! Includes the game software and the Wii Balance Board. uDraw is great for your kid's creativity. 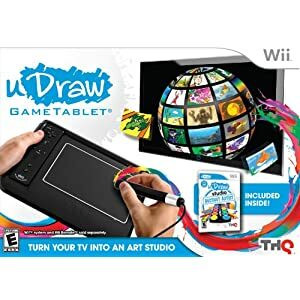 Let them draw and play games using this art tablet. Punch-Out!! is a boxing video game created by Genyo Takeda and Makoto Wada of Nintendo. This series has been out since 1984 and has had numerous releases on all of Nintendo's consoles (NES, SNES, Virtual console, Wii and WiiWare). If you're a fan of Marble Madness then you're going to love Vertigo for Wii! From the makers of Guitar Hero, DJ Hero is a game for the hip hop crowd. This collectors edition of DJ Hero features songs from Jay-Z and Eminem. This bundle includes the DJ Hero game and turntable. Mario Kart bundle includes: 1 black console and nunchuck, sensor bar, Wii console, steering wheel and Mario Kart! This is a great bundle for anyone that loves the Mario Kart racing game! NHL Slapshot game included with two limited edition Wayne Gretzky hockey sticks. Take to the ice as "The Great One", #99! We're getting the band back together! This Beatles bundle includes the Rock Band game, Höfner bass, Beatles branded drums, mic, mic stand, and special Beatles content! This bundle includes the game and Top Shot Wii sawed off shotgun. Mini-games featuring fast paced hunting of upland birds, waterfowl, and 13 mutlplayer minigames.